Cindy Carter is a volunteer with Calvary Community Church and a star AppSheet user/Community Moderator. We asked her to write about her experience using her DIY apps for a day of service the church holds each year. Let's welcome Cindy as AppSheet's very first guest blogger! A prayer circle comes together before Serve Day begins. Each year in late spring my church, Calvary Community Church in Westlake Village, California partners with the ACTION Foundation (Area Christians Taking Initiative On Needs) and other Ventura County churches for Serve Day, a day in which volunteers share their time, talents and treasures through acts of service that change lives and strengthen our communities. We come together to be the hands and feet of Jesus and put our faith into action. Serve Day volunteers are men and women of all ages, with a wide range of experience and capabilities. We join in fellowship to perform home maintenance and repairs for those experiencing financial difficulties, we provide musical entertainment and visit with seniors in nursing homes, and we show appreciation to our local police and fire departments with baked goods. In addition, we clean-up overgrown yards, offer sports, dance and craft lessons to underprivileged children, feed the homeless and provide lunches to day workers. We care for at-risk foster youth, assist those with special needs, and build wheelchair ramps. 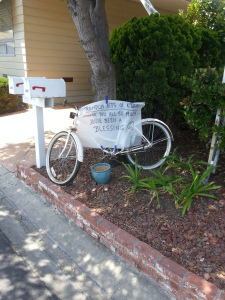 We pray that through our actions those we serve are blessed, as we in turn are blessed many times over. Calvary is a large church, so most events involve a lot of people and require significant coordination. Thus, Calvary has a Serve Day Administration Team composed of a great group of people with complementary talents including Doty Santamaria, Jaime Chambers, Christina Robertson and Ken Chambers, each ready to tackle the challenges before them. I volunteered with this team last year. With my software and database program management background, I wished to make their jobs easier this year. With 60+ projects throughout the county and over 1,000 volunteers, we needed a flexible tool that was user-friendly and could be easily deployed. Last year, we used a database application that was more complex than we needed and much too expensive for our budget. When searching for a new solution this year, I found AppSheet and was so relieved — I immediately knew AppSheet would be a perfect fit for us! I effortlessly devised our first app, a simple list of Serve Day projects. Christina assessed these projects and was amazed at how promptly the search button could help her pinpoint which projects needed specific supplies. As I learned AppSheet’s features, I upgraded this first app and developed seven more apps to support various Serve Day objectives. I also fashioned Serve Day application logos to help users identify the correct app for the task at hand. And since it was important for us to protect personal information, I utilized white lists to grant access only to specific individuals. One of my favorite AppSheet attributes is the ability to link datasets to reference tables. For the purposes of Serve Day, I linked volunteers to projects. Most of our apps used the same source data, with the filters enabling me to slice the information based on the app’s purpose. And the capability to refine an app’s content by login email permitted me to define merely one app for all project leads. AppSheet’s thoughtful design minimizes the level of effort required to maintain apps — what a time-saver! The Send-off app, presented below, was used at our rally before we dispersed to our Serve Day projects. It was indispensable. When someone needed assistance finding their project, Ken pointed them in the right direction. If we needed to contact a project lead, we could utilize the app’s phone action symbol. As people arrived to register on-site, I searched the app to match their skill sets to projects still in need of volunteers. AppSheet was responsive and reliable. 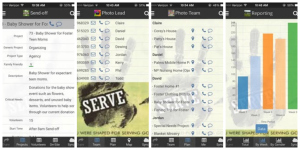 In addition to the Send-off Rally app, the apps above were developed for the Photo Lead to assign Serve Day projects to photographers and for the Photo Team members to navigate to their respective project sites. I further created a Registrations app that Jaime could use as a church software supplement in the weeks leading up to Serve Day. She could process advance volunteer registrations and direct individuals to the correct project leads. Likewise Doty regularly used this app to research assignments in detail and move volunteers between projects when necessary. Finally, AppSheet charts provided us with our on-demand Reporting app (shown above) for quick assessments, so that we could identify and reach out to different church groups that still needed to register. AppSheet was truly a Godsend to us! AppSheet made so many tasks more expeditious to complete. And because its spreadsheet-based, its readily understandable. That’s one of the main reasons the entire team instantly gravitated to AppSheet. And while our DIY apps tremendously helped to streamline the activities of this year’s Serve Day, a significant ramification in subsequent years will be even greater automation of Serve Day processes. In turn, this means that Calvary will be able to comfortably accommodate increased volunteer participation and thus serve more people in the Conejo Valley and surrounding communities. AppSheet has so many great features and a professional, supportive team behind it. They welcome suggestions and are regularly improving the product. I haven’t had the opportunity to utilize all of its elements but I am already exploring new ways to use AppSheet for next year’s Serve Day. For example, we will definitely benefit from the recent texting option, we plan to use our Project Lead app to record volunteer attendance, and we may even enable resource requests and photo submission functionality. Just recently, I asked some users to test an app and provide their feedback. Unfamiliar technology can be intimidating, but one user ran the app in a web browser, quickly understood how it could benefit her, and even requested additional components. AppSheet works for you by offering various options to meet your requirements and by supporting your partners regardless of the tool they prefer. Our team really loves helping with Serve Day. However, regardless of who is on the Serve Day Team from year to year, it is important that it continues to operate effectively and efficiently. To that end, the AppSheet structure we put in place this year will support future Serve Days as well. Anyone that may step in to fill our shoes can do so with very little training. AppSheet is so simple to learn that new team members can be impactful in no time at all! Overall, the most compelling effect of our apps’ deployment was the ability they gave the team to take our attention off of process and data management and put it where it belonged — on living and loving like Jesus by focusing on those we intended to care for on Serve Day and by emphasizing the importance of making Serve Day the beginning of Serving EVERY Day. *App content has been changed to retain privacy.